Diaper changing as a ritual The position of parent and baby during a diaper change is perfect for creating a bonding experience between you. You are leaning over your baby, and your face is at the perfect arms-length distance for engaging eye contact and communication. What’s more, this golden opportunity presents itself many times during each day; no matter how busy you both get, you have a few moments of quiet connection. It’s too valuable a ritual to treat it as simply maintenance. 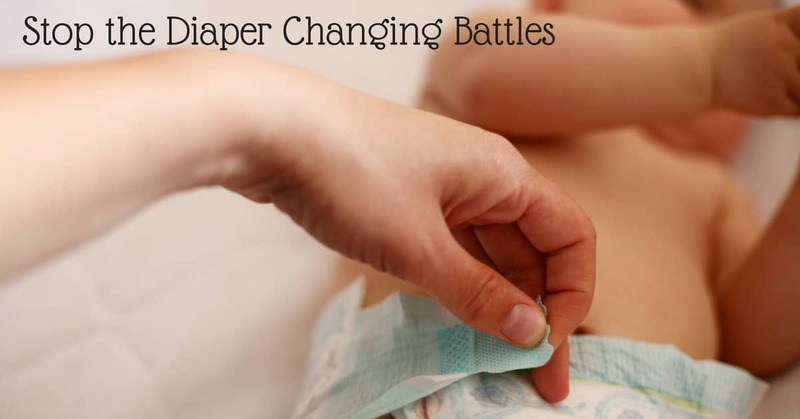 Learning about your baby Diapering offers a perfect opportunity for you to truly absorb your baby’s cues and signals. You’ll learn how his little body works, what tickles him, what causes those tiny goose bumps. As you lift, move, and touch your baby, your hands will learn the map of his body and what’s normal for him. This is important because it will enable you to easily decipher any physical changes that need attention. Developing trust Regular diaper changes create rhythm in your baby’s world and afford the sense that the world is safe and dependable. They are regular and consistent episodes in days that may not always be predictable. Your loving touches teach your baby that he is valued, and your gentle care teaches him that he is respected. A learning experience for your baby Your baby does a lot of learning during diaper changes. It’s one of the few times that she actually sees her own body without clothes, when she can feel her complete movements without a wad of diaper between her legs. Diaper-off time is a great chance for her to stretch her limbs and learn how they move. During changing time, your baby is also a captive audience to your voice, so she can focus on what you are saying and how you are saying it — an important component of her language learning process. Likewise, for a precious few minutes, you are her captive audience, so you can focus on what she’s saying and how she is saying it — crucial to the growth of your relationship. What your baby thinks and feels Many active babies could not care less if their diapers are clean. They’re too busy to concern themselves with such trivial issues. It may be important to you, but it’s not a priority for your child. Diaper rash or uncomfortable diapers (wrong size or bad fit) can make him dread diaper changes, so check these first. Once you’re sure all the practical issues are covered, make a few adjustments in this unavoidable process to make it more enjoyable. Take a deep breath Given the number of diapers you have to change, it’s possible that what used to be a pleasant experience for you has gotten to be routine, or even worse, a hassle. When parents approach diaper changing in a brisk, no-nonsense way, it isn’t any fun for Baby. Try to reconnect with the bonding experience that diaper changing can be — a moment of calm in a busy day when you share one-on-one time with your baby. Use distraction Keep a flashlight with your changing supplies and let your baby play with it while you change him. Some kids’ flashlights have a button to change the color of the light, or shape of the ray. Call this his “diaper flashlight” and put it away when the change is complete. You may find a different type of special toy that appeals to your little one, or even a basket of small interesting toys. If you reserve these only for diaper time, they can retain their novelty for a long time. Try a stand-up diaper If your baby’s diaper is just wet (not messy), try letting her stand up while you do a quick change. If you’re using cloth diapers, have one leg pre-pinned so that you can slide it on like pants, or opt for pre-fitted diapers that don’t require pins.